Being bothered by your facial hair is not as uncommon as you might think. You’re certainly not alone in feeling this way, so it’s perfectly fine to do something about it – lots of women do. If you’ve tried shaving or waxing and found that those solutions aren’t for you, it’s time to find a good epilator. Unlike shaving, an epilator will remove facial hair at the roots, leaving no stubble behind. And unlike waxing, an epilator removes hair without taking any of the surrounding outer skin. That means clean hair removal with less irritation. As with most personal hygiene products, not all epilators are created equal. That is why we reviewed many of the top facial epilators on the market to help you narrow down your choices. We go over each of the units in our roundup of top facial epilators in detail below, but for those in a hurry our top choice is the Philips Satinelle Essential HP6401. This unit’s combination of excellent features and competitive price make it an excellent choice for anyone looking to remove unwanted facial hair. 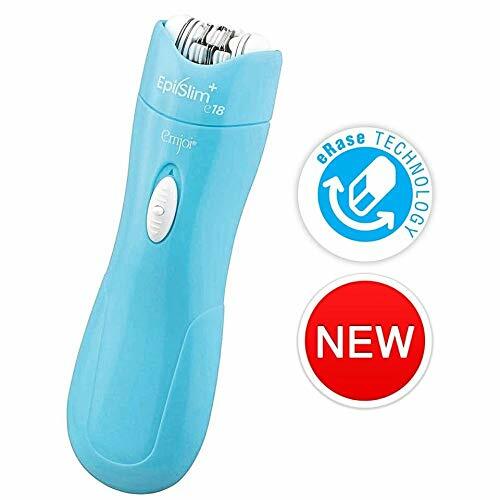 This efficient epilator is compact and very easy to use. You can use it all over your body, whether you need to remove hair on your face or on your legs. It can save you a lot of money on things like wax because it removes hair easily and efficiently. You won’t have to spend a long time removing hair if you choose the Philips Satinelle Essential HP6401. The design enables a non stop use, making the whole process so simple and so uncomplicated for the user. There are two speed settings on this Philips epilator so you can control the speed depending on your particular needs. There are cap attachments that you can use to reach those patches of hair that are hard to reach and when you need something more delicate. To keep the epilator more hygienic and to enable safe cleaning, you can remove the epilation head. It’s fully washable and this is important from a cleanliness point of view. The design is corded making it great for none stop use. All in all, the Philips Satinelle Essential HP6401 is a very convenient and easy to use epilator. As well as being very easy to keep clean, the epilator is also efficient with the use of an easily removable cap. This also makes it more hygienic for users. The ease of use offered by this epilator is epitomised by the overall ergonomic design of the product. It fits very nicely in the hand and doesn’t cause any aches, even when you’re using it a lot for a prolonged session of hair removal. 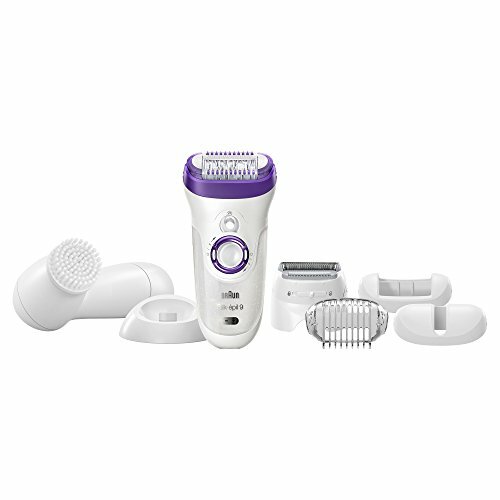 The Braun Silk-épil 9 9-579 Women’s Epilator has a very wide head that helps you to remove hair easily in just one stroke. It claims to be able to leave you with smooth skin for up to four weeks. It uses an innovative type of tweezer technology that removes hair with real precision and achieves a hair removal performance that a solution like wax never could. It can be used both wet and dry, and it’s perfectly comfortable to use. There are a few attachments that come with it as well. The 40% wider head that comes with the Braun Silk-épil 9 9-579 Women’s Epilator is one of its major selling points. It makes the epilator a lot easier to use for many people, and that’s what gives it the intuitive functionality that lots of people enjoy from the device. The long and deep tweezers used by this Braun epilator allow it to get all of those little hairs and it doesn’t take a huge amount of time to remove hair. They provide real precision when you need it most of all, and that’s massively important. Lots of people find that this is a great epilator for when your hair and skin is wet. You’ll find that it’s smooth and easy to use and that it gets the job done. Even people who have had problems with pain being caused by the epilator carry on using it because it does the job so well. Pain is a lot less likely to be experienced when it’s used wet rather than dry. Once you get the hang of using it, it won’t take you long at all to remove hair efficiently, and you’ll learn how to do it in a way that’s most comfortable for you. When it comes to electric grooming products, Panasonic is a name that you can trust. The ES-ED90-P Wet/Dry Epilator is no different. It offers a complete performance powered by a dual-speed motor and a range of snap-on hair removal attachments. It works as an epilator, but the attachments that come with means you can use it for a whole range of things. It’s this convenience and multifunctionality that make it stand out from the crowd. It’s great for people with sensitive skin as well. The fact that the epilator is multifunctional makes it suitable for all kinds of grooming needs, and that definitely makes it different from many of the other options out there on the market right now. It means you can remove just about every kind of unwanted hair. 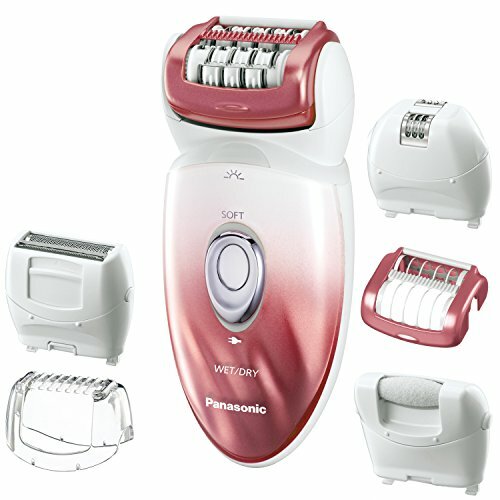 There’s also a pedicure buffer that comes with this Panasonic epilator. This allows it to remove dry, dead skin that’s causing you problems. It’s another example of just how much can be achieved with this one little device. The main reason to buy an epilator like this one is the variety of options it provides you with. You can use it all kinds of ways, including all kinds of hair removal and dead skin removal. There’s a lot of heads and attachments that you can make use of. This precision epilator gets right down to it and removes even the smallest and finest hairs that can often be the most problematic ones. Its comprehensive hair removal performance allows you to have confidence in it when using it on your face. It has a guide cap set at a particular angle to ensure the maximum amount of hair is reach and removed when you use it as well. 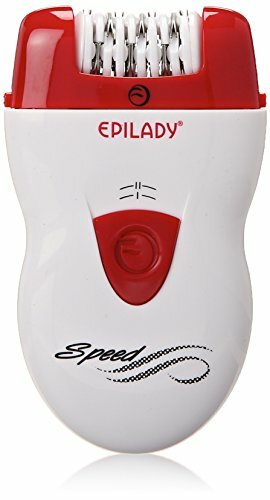 A lot of thought and attention has gone into the design of the Epilady Speed Corded Epilator, and you can find out more about it below. If you’ve never used an epilator before, the angle guide cap can make the task a lot easier. It ensures the epilator is always making contact with your skin and removing hair at the right angle for the best possible outcomes. 3100 tweezes per minute from 40 tweezer discs remove the hair when it’s at full speed. This ensures all of those little awkward hairs are properly removed each time you put the epilator to use. If you’re completely new to this and haven’t owned an epilator before, this is possibly the best option for you. Using it successfully is very easy and you won’t have any trouble at all getting started. It does what you need it to in a simple and straightforward way. That’s what most people are looking for when choosing an epilator, whether they’re buying their first or their tenth. This product is both high-quality and affordable for customers. It’s easy to use and offers an effective performance that you won’t feel let down by. It’s particularly good at getting at hairs in those small areas that can often be tough to remove hair from. It’s not for removing massive amounts of hair but for removing small amounts of facial hair, it does exactly the job you want it to without any problems whatsoever. Used in small sessions and small bursts, you’ll be very happy with the hair removal experience it offers. The Emjoi Epi Slim Epilator uses 18 tweezers, which makes for more effective hair removal for the user. It removes hair very effectively and having that many tweezers allows the hair removal performance to be more precise and more effective at removing fine facial hair. This is one of the smallest and most portable epilators out there right now, so it’s definitely good as a travel option or when you want to take it with you for whatever reason. The compact design has no negative impact on functionality at all though. If you’re in need of an epilator that’s able to deal with small patches of hair that are causing you trouble and aren’t being dealt with by other methods or products. It’s very good at taking care of problematic areas, so it’s a good solution if that’s what’s causing you headaches. It’s a nice little personal grooming companion that you can take with you everywhere you go. If you need something that offers that portability and you are yet to find an adequate solution, the Emjoi Epi Slim Epilator might be what you’ve been looking for. Hopefully the information above will help you find just the right epilator for your needs. While each have their own strengths, they are all quality units that can help give you smooth, hairless facial skin.